Two years ago, I started posting pictures of my home on Instagram. Prior to this, I had been a regular user (in a non addictive way) of the platform, using it to post arty looking pictures of my food, my kids and glasses of Prosecco. Lots of glasses of Prosecco, if I'm honest, and fair few cocktail shots. I had a friend, Emma, who was also on Instagram and we were always making up 'hilarious' hashtags to accompany our posts. These mostly involved penile shaped cacti with faces and animals wearing clothes (we were particularly fond of cats in Victorian bonnets). Anyway, after several months of hashtag use such as #cactuscalamity, #sombreropenis and #whengoodkittensgobad, I realised that the use of hashtags could open viewing of your posts to more than one similarly comedically minded friend. I started decorating the rooms in our new house, one by one, and in January 2016, I began joining in with a hashtag game which I'd discovered completely by accident. It was #mystylephotochallenge and it gave you a prompt every day with a different subject, be it a colour, an activity or a style. For me, it was the entrance to a whole new world. I realised that whatever the daily subject of the prompt, I was relating it to my home interiors. I'd always been completely interior obsessed and I soon started posting regular home styling shots. Hashtags meant that other people outside of the hashtag group could also see my posts and by maximising the hashtags and taking a good photo, my following shot up. After starting #mystylephotochallenge with 35 followers, by March I had 800 and by December of the same year this had grown to 20k. I gave up my job, I started blogging about styling your home, running workshops and before I knew it, I had a brand new, full time career. Bloody hell. Julia Eldon, Owner of Suburban Salon. But I'm not alone in this jump from hashtagging erotically challenged succulents to concentrating full time on social media based output. There's loads of us. From small brands who have built their business completely on the platform, to Insta friends who have paired up to start a creative business, to aspiring interior designers who have finally been able to fulfil their dreams, Instagram has been an enabler for people with a creative lean to fully reach their potential and in some cases, completely change their life focus. Take my business partner and friend, Dee. When we met (in a totally non Tinder style way) on Instagram whilst taking part in #mystylephotochallenge, her role was Project Manager in a large financial company where she had been for 25 years. After a year of growing her following, she took a years sabbatical to see if she could focus on a career change and in November, she was finally able to say sayonara to her old job and concentrate full time on her interior design business. Or my friend Julia, who has a small business called Suburban Salon. She'd been making beautiful stools (no pun intended) in sheepskins and mongolian fur from her home - Instagram enabled her to take this a step further and now her order book is full to the brim and she's expanding her product range. 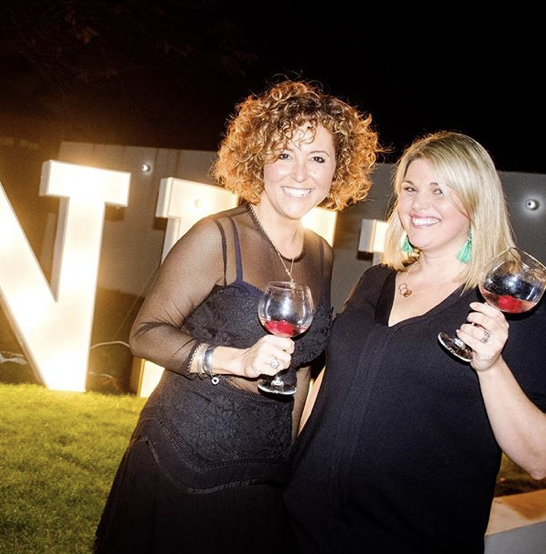 And what about Katie and Amy, who met at one of our workshops and teamed up to create No House Rules, a networking event company based in the North Of England with the aim of bringing similarly interior minded people together? There are countless stories of people changing their life to focus fully on things that they have always dreamt of doing. And it's all through Instagram. Katie & Amy, No House Rules. One thing that is patently obvious about the interiors community on Instagram is that it almost wholly consists of women. I've got 93k followers and only 10% of these are men. It's clear that in general (although not exclusively), women are more focused on interior photography than men. However, this interest isn't the only reason why this platform is such a magnet for creative people of both sexes. I'd spent years hearing people comment verbally on my home, not necessarily in a good way. I've always loved trawling a charity shop and I'd always appreciated that it's not to everyone's taste. I'd lost count of the times that friends had looked at my mid century furniture and commented, 'my granny used to have that'. When I first started posting pictures of my home, I would be falling over with joy every time I received a complimentary comment. I'd immediately comment back (engagement - the solid basis of account growth, btw) and before I knew it, I'd formed a bond with that person. That bond was interiors. I could walk around the supermarket and not meet a single person who would want to talk about interiors. But on Instagram, EVERYONE did. Because that's why they followed me and that's why I followed them. It created a community with a foundation of people who liked the same things. It's a community of real people. It's real people's homes, not magazines, not High Street room sets. Prior to the introduction of our hashtag, #myhomevibe, there was no UK based interior feed that concentrated entirely on home styling. What #myhomevibe did was create a feed that was achievable inspiration - posts that showed homes that were furnished from both small and large stores, upcycling projects completed on a budget, creative projects that we could emulate. It whisked the elitism away from the concept of interior design and gave us the confidence to try new things in our homes that weren't necessarily influenced by trends or the High Street. The hashtag that started the whole thing off. The main bonus of this new community is that it encourages people to put themselves out there. If you post a photograph of something that you are proud of and people comment and like it, it's a boost to your confidence. When they like your next post too, it makes you feel even better. And before you know it, you can't understand why you were so nervous of doing it to start with. People are truly interested in what you are posting and why you are posting it - if they weren't, they wouldn't be following you. Once you realise that people are accepting and interested in you and what you are doing, then your confidence grows. And as an excellent by product of this acceptance, this confidence expands into other areas of your life. For women, for whom the traditional workplace has often been a place of extreme inequality, it's a whole new ballgame. Take my examples above of Instagrammers who have been encouraged to take their dreams to the next level. As your feed develops, it takes time to work out who you should be following to inspire the route that you want to take. One of the questions that Dee and I are regularly asked at our workshops is 'how do you decide who to follow?'. It's actually a very good question. You need to think about what you trying to get out of your feed, whether it be ideas, a business audience or indeed, simply friendship. For me, I like to be inspired, both by amazing interior images and by captions that reflect the personality of the feed. In other words, I like a bloody good photo and a laugh. As a fairly transient decorator (you might have noticed), my style is ever evolving and as such, my following list evolves too. So which feeds do I enjoy the most and why? I'm always drawn towards feeds which are almost purely home styling, mostly because I enjoy seeing original ideas and finding achievable inspiration for my own home. There are plenty of feeds that I love, but here's my faves, most of which I have followed right from the start. All of these feeds post cleverly styled photographs, the majority of which are their own home. Dee and I started posting at exactly the same time and created a workshop partnership which is growing and growing. She's a fan of fairy lights (often in places that the Health & Safety Executive wouldn't approve of) and she's prone to posting pictures of her bathroom and, more recently, her feet, on a regular basis. Her feed is beautifully curated and a joy to see. Her claim to fame is that she's Chris from Love Island's cousin and she often likes to remind me that she beat me to 100k followers. Kate is another example of an Instagram business gone viral. Her Cowboy Kate Outpost is famous for rare breed sheepskins and she's soon to expand into other products. She's the most creative feed that I follow on Instagram and her home is completely amazing, with hand drawn murals and gold leaf effect walls. Kate is a shining example of how Instagram can showcase real creative talent. Featured in the Rockett St George Extraordinary Interiors book, she can turn around a room redecorate in one weekend, no holds barred. With her account @_one.four.six_, Katty's house has a laid back, beach vibe and I absolutely love it. Based in Northern Ireland, she's super creative and she's always got a project on the go whilst looking after her two gorgeous red headed boys, the Foxy Brothers. Her Stories are always hilarious, positive and refreshing and she's an absolute demon for a charity shop purchase. Plus she's bloody lovely and she's got a surf board and a bike on the wall in her living room. Enough said. When I first started posting, Nichol was one of the first US accounts that I found. At the time, her living room was decorated in Cole & Son Palm Jungle and I was obsessed with the clean, fresh, eclectic look of her home. She's never shied away from change and last year decorated her rooms a dark shade, before bringing them back to white. Her outdoor area is a constant source of inspiration and I have totally copied her pink front door (now green - phew). Not only does Kate write the most successful interior blog in the UK - Mad About The House - but she's also about to publish her second book. Despite this hectic lifestyle, she still manages to post daily pictures of her super stylish house and she has the best library corner on Instagram. Her feed includes regular updates in regard to the current mood of her cat, Enid, who possesses her very own chaise. Dan writes a blog, Miller Grey, and his home is an alter to the colours of grey and white. It's hugely cool, beautifully styled and his feed is perfection (unlike mine which looks like a dogs dinner in comparison). He spends time on his photography and it shows - his posts are serene, calm and simply beautiful to look at. He's also a very nice person and is extremely good at flat lays. As the writer of interiors blog French For Pineapple, Bianca is also my co host for Revamp Restyle Reveal and her home is ridiculously cool. 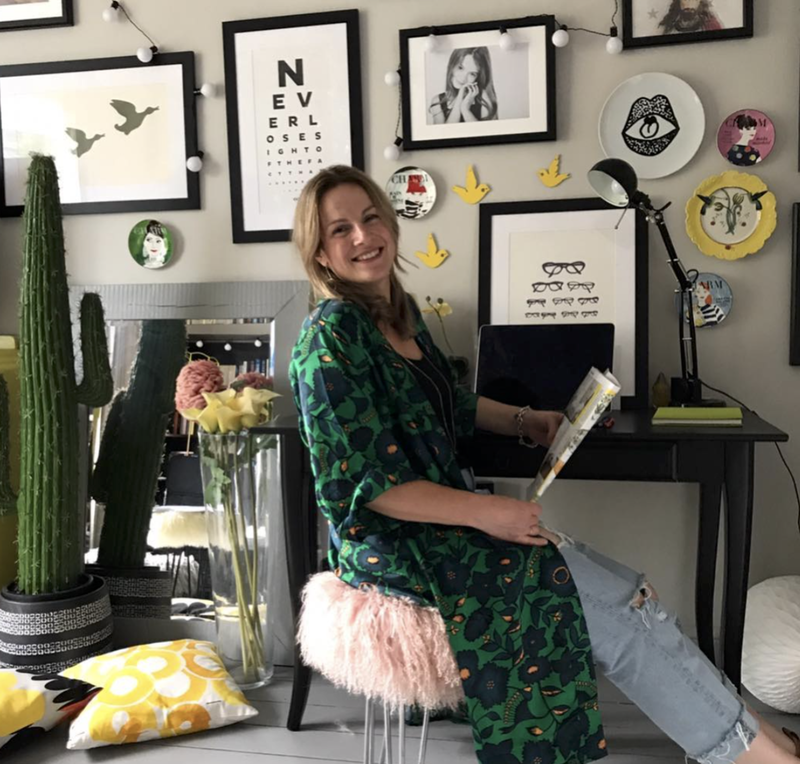 She's got the best art collection on Instagram and always has an extremely complicated and impressive DIY task on the go (take headboard making or sideboard plying as examples). She's the originator of the term The Decorating Domino Effect (where you start one project and before you know it, you've started four at the same time). She also has a solid track record of predicting trends two years in advance and is ALWAYS ahead of the game. Once Bianca has ditched it, you know it's over. If I was to think of one person who summed up the fabulousness of the Instagram interiors community, that person would be Jen. Her US account, Blissfully Eclectic, does exactly what it says on the tin and her decor is beyond amazing. She's always trying new things and is constantly redecorating. Think planked walls and hand drawn wall murals and you won't be disappointed. Her Stories will light up your day and her hair is FAB. A truly lovely person. Liz's feed has been inspirational to me ever since I started posting on Instagram. This is the woman who renovated a Winnebago with flamingo wallpaper and a massive 'nudes' neon in only a 4ft bathroom space. 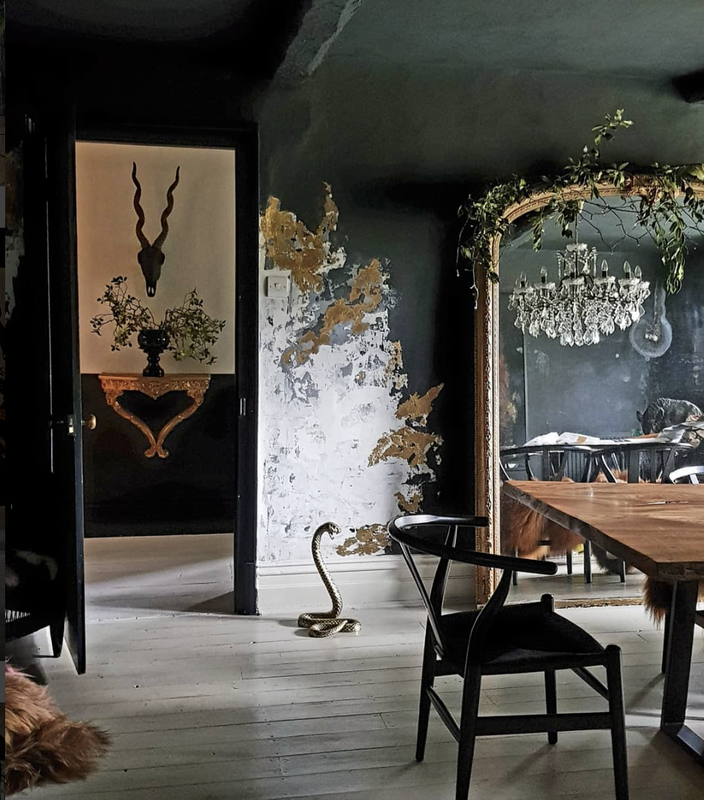 She's hugely creative and her home is wildly textured with hand drawn murals and wall treatments. The laid back tones of her feed are a breath of fresh air. She's also extremely cool. Pandora is York's answer to Barbara of The Good Life and her home styled feed is a fabulous flurry of vintage, country chic. 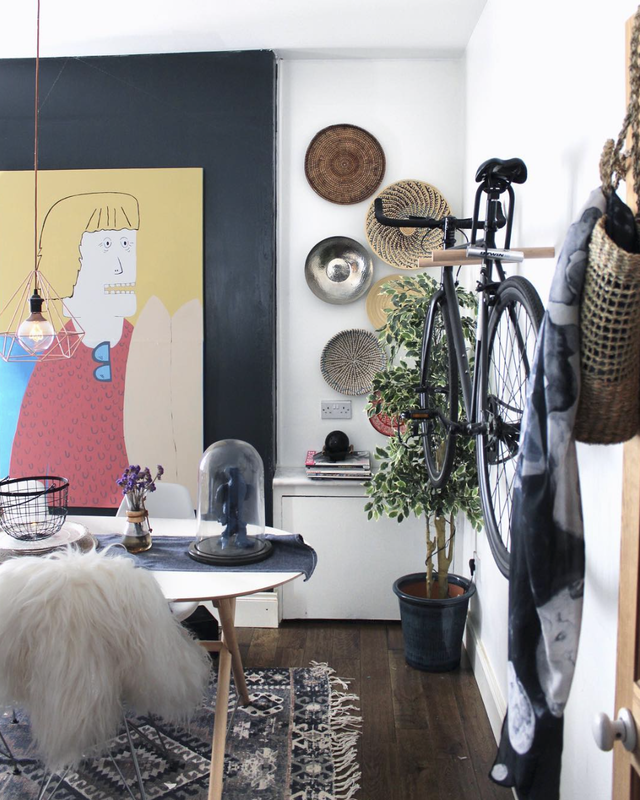 Her home is filled with family treasures and her layering of colour and textures is on point. She's always got a roaring fire on the go and her family are virtually self sufficient with the produce from their vegetable patches. Oh, and she's also got Shetland ponies, pigs, lambs and chickens in her back garden which she regularly Stories. As you do. So those are the accounts that inspire me daily. When I started posting on Instagram, these accounts helped me to realise that if I was inspired by their feeds, then maybe my OWN feed would inspire other people. It's following feeds like these that gave me the confidence to try and succeed in an area that I have always been obsessed with and never dreamt I would be able to work in. What I find the most exciting thing about Instagram is that there are no boundaries. There's no benchmark as to what can be achieved. It's an open forum, a platform whose use has doubled in the last year and it's growing faster than anyone could ever have predicted - the opportunities, particularly for women, that are evolving from this growth are infinite. After working for years in a traditional work environment, the empowerment that I feel from managing my own career and the knowledge that I and I alone can decide on what direction it goes from here, is unquantifiable. For the first time, you don't need to have a particular background to be able to succeed in an industry - on social media, it's a level playing field. The opportunities are endless. Now, go grab them and be empowered.